No track markers, no blue or yellow arrows nailed to trees, no signposts. There are just paw prints in the sand that have created a well-worn pad leading along the dry, sandy creek bed. Today we are following a trail of a different kind: the dingoes' run. The path heads east. It is packed down from regular use. 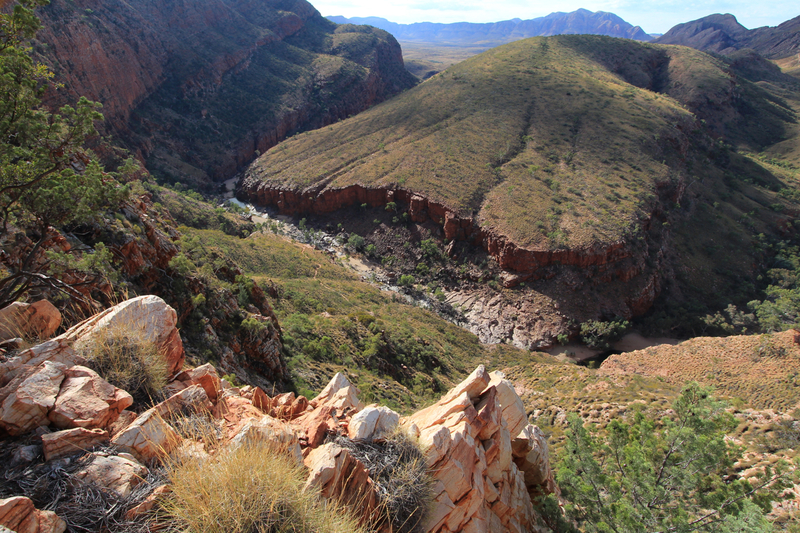 Small prints show the dingoes daily travels to and from the Ormiston Gorge campground. They have set a small, efficient path in the sand and it is leading in the right direction for us. 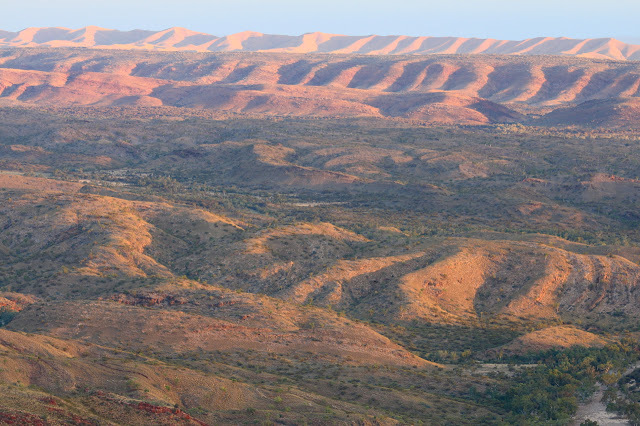 So, we follow, all the way from Ormiston Gorge to Bowman's Gap, which is a north-west break in the huge, beautiful bowl that is Ormiston Pound, in the West MacDonnell National Park out of Alice Springs in Australia's Northern Territory. 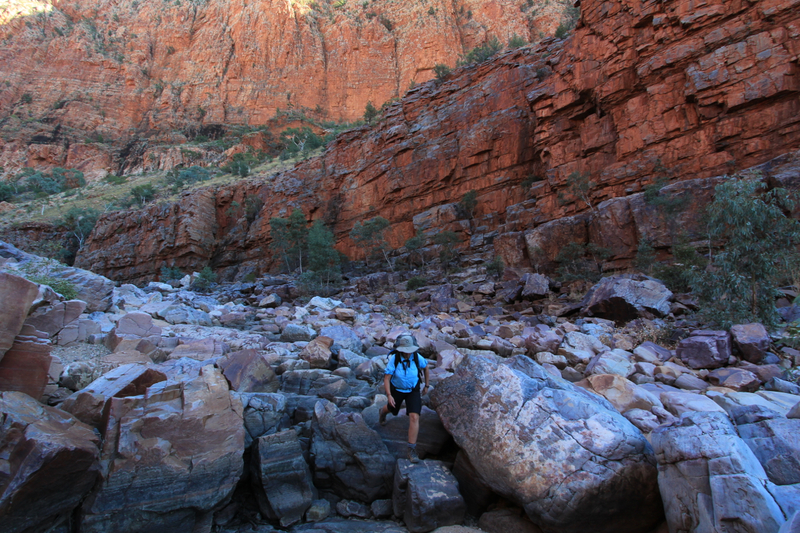 We leave the Ormiston Gorge Kiosk at 8.30am. Another couple of walkers, tackling the amazing Larapinta Trail, can be seen wandering east but, once we push into the gorge, we have the place to ourselves. Dark pools of water, left from the last rains, attract a surprising variety of birds. Two short-legged dotterels trot along the damp edge of the first pool. Zebra finches are squeaking in the trees. Several different types of honeyeaters squabble and bully and chase each other through the river gums. Further along, and nearly at the gorges eastern end, the walking is trickier as the creek bed becomes strewn with large boulders. Some sandy shoals between the rocks reveal more dingo prints, which guide us along the easiest route. Where the gorge ends, the sky begins. We use the Ormiston Pound Track for a short while. 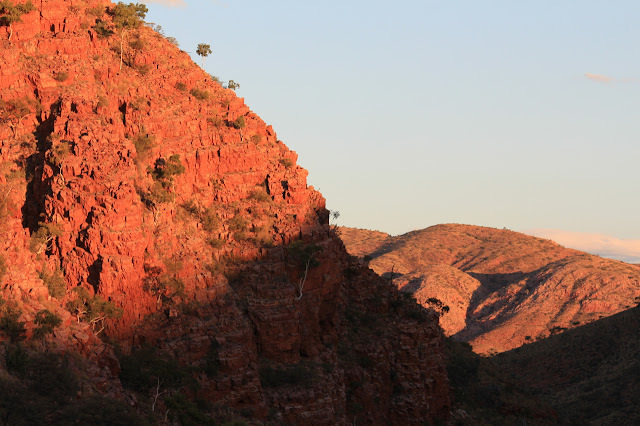 It is a wonderful 6 kilometre loop walk that leads through the gorge and around through the Heavitree Range. Where it turns south, we turn north, following the wide, dry bed of Ormiston Creek towards Bowman's Gap. There is no sign-posted track but this is a popular overnight walk for locals and visitors who know the area well. The creek can be followed all the way to the gap, which is a clear break in the rim of the circular pound. After a rocky first half kilometre the riverbed turns to coarse sand, which makes for tiring, soft walking. But, the dingoes pick the easiest route and the shortest course. We follow them where we can. We are carrying enough water for an overnight trek but have brought food for two nights. If we can find decent water to resupply our needs then we will stay out as long as possible. Approaching Bowmans Gap there is a large stagnant pool, the same colour as the diarrhoea it would probably induce if consumed untreated. We press on in the hope of something better. 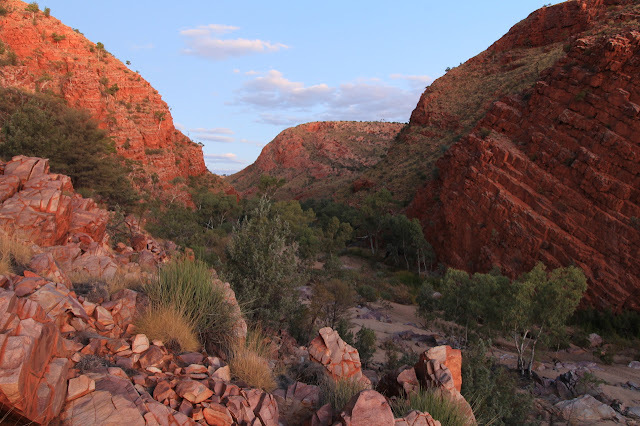 The dingo pad, winds around the edge of the big pools, slowly but surely leading us between the sheer red walls of Bowmans Gap and finally to a perfect campsite - a sandy, flat patch of ground shaded by a river gum and the walls of a cliff. Below it lies a perfectly clear pool of water and we know we are on a winner. Sunset's afterglow casts a pink light on the rocky ribs of the range and the near full moon has risen in the east when the dingo howls. The sound is not far upstream from camp and is eerily human although slightly comical - a bit like ghost noises in some spoof horror flick. Then he hits the right notes and it becomes more of a song. The dingo howls and I listen until it is dark and quiet and our lonely campsite is all there is left of the world. It is like sleeping with the light on, when lying under a bright moon. However, that is not what has kept me awake. I can hear a strange snorting noise. Perhaps a euro has come down to drink from our clear pool. They often only move at night and so I sit up, excited to see how close it might be. Instead the moon illuminates the small shape of our dingo friend, standing just a few metres away. He makes a feinting lunge towards us and snorts. It reminds me of our farm dog, as a kid, when he used to see a snake and lunge at it to test its fight or flight reaction. The dingo jumps forward again and then retreats a few steps, after it lets out another snort. I nudge Caz awake and whisper: "There's a dingo." Caz sits up and looks downstream into the distance. "No no, right there, like just there. Five metres away." Now we have both seen him, a long stare-off ensues. We wait. The dingo waits. It is not until Caz waves his arms in the air that it finally retreats, taking off with one last look over its shoulder, before settling into a steady trot, following the dingo run into Ormiston Pound. Before leaving the gap, it gives a series of long howls and a few minutes later gets a rousing response from the main pack. They are still upstream of us but only just around the corner – we pick a few different voices within the chorus of noise. One of them, at the end, sounds young and yippy. A pup, perhaps? It makes for a restless night's sleep. I wake with every noise, expecting to see the whole pack, lit by moonlight and sniffing at our heels. All that does wake me are tiny brown frogs jumping around the sand and rocks, onto our heads and bivvy bags. 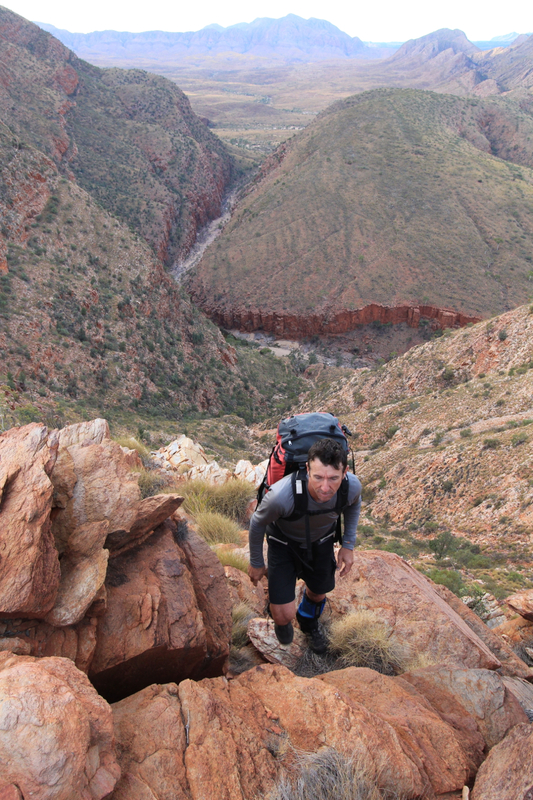 Our return route to Ormiston Gorge leaves the dingo trail behind and heads onto the ridge that forms the north-west wall of the gorge. Another off-track adventure. The alarm buzzes at 5am and we wait for enough light to walk by. Two-thirds of the way up the range, the sun rises and lights the ridge tops and the swaying seed heads of spinifex. There are stunning views across to Mt Sonder, whose peak is entwined in a shifting veil of mist. With enough water on board for a second night, thanks to our small re-supply pool, we plan to camp up high along this range. Walking across the top of the ridge, although not a big distance in kilometres, is slow. The uneven ground takes a lot of concentration. It is all rocks: clusters of round quartzite that are often broken and uplifted into sharp ridges. 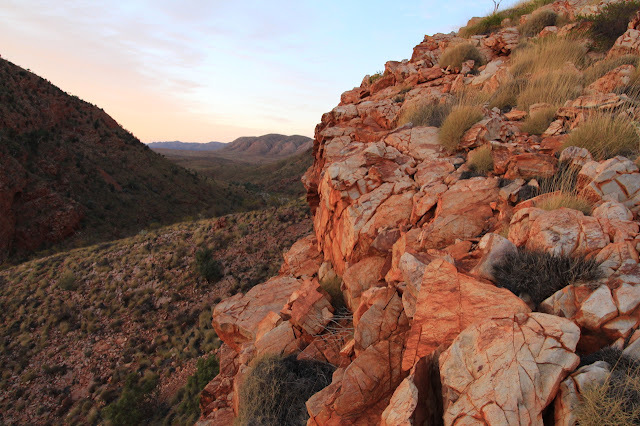 Clumps of Spinifex and thorny tough shrubs block the way. Then there is a short section of dirt and smaller stones and for a few metres the going is easier. Close to the edge of the range, where it drops steeply or sheerly to the gorge below there are occasional stone terraces and we walk these when we can. In fact the only flat, bare patch of earth on the mountain becomes our campsite. 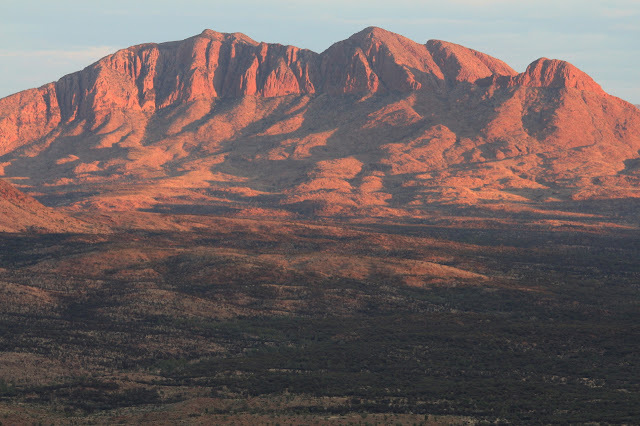 It is perched right near the cliff edge with magnificent views due east, along the gorge towards the pound and the rugged peaks of both the Chewings and Heavitree Ranges with Mt Giles dominating the horizon to the east and to the distant west is Mt Zeil, the highest mountain in the Northern Territory. 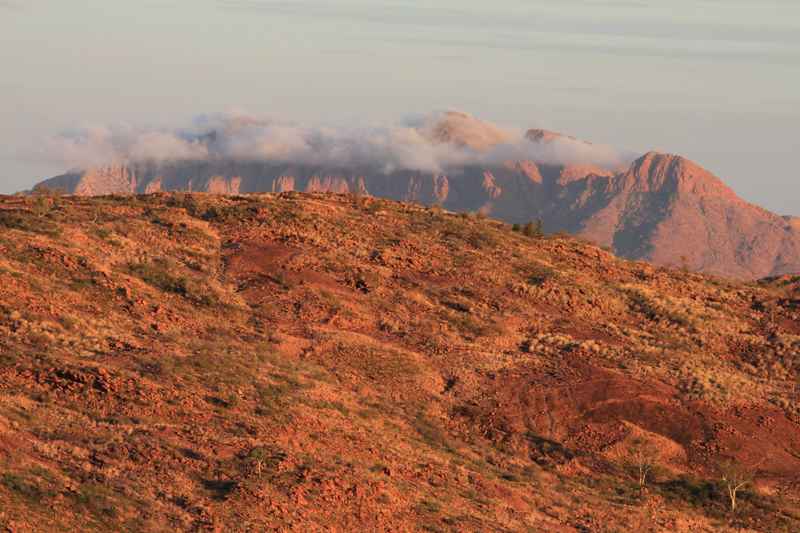 To our right, the MacDonnell Ranges stretch away in a long, undulating line of rounded peaks. Below are tiny, ant sized people in bright shirts, rock hopping up and down the Gorge and behind me suddenly seven pelicans appear, drifting southwards, circling on a thermal. These are the strange wonders of wilderness and the arid zone. The next morning, heading across the top of the range, Caz stoops every now and then, bending down to run his fingers through the flowering curry wattle. The scent it leaves on the skin is delicious, like opening a box of Keens Curry Powder and inhaling deeply. Our descent ridge is visible ahead. 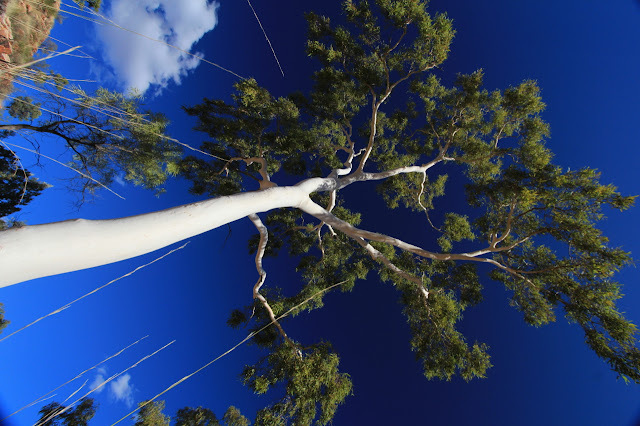 From this angle it looks completely crazy, like a knife edge scarp of rock that drops precipitously from the top of the range down to the Ghost Gum Lookout above Ormiston Gorge. At times though it feels like we are following a good trail and we put it down to the presence of large Euros in these high rocky places. The track leads us from the last saddle, up a loose rocky rise to an outcrop of rounded white boulders above our descent ridge. The route now reveals itself. It is a perfect choice, steep but not sheer, and a piece of old orange peel confirms our suspicions – bushwalkers have been here before us. You would be crazy not to. Our high perspective gives stunning views. 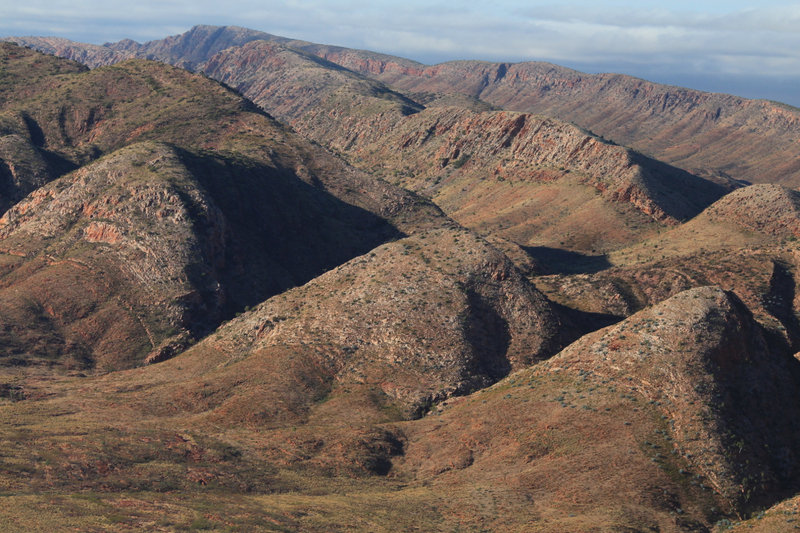 It highlights the spectacular, rugged depth of the gorge and its narrow winding path where it cuts through the ranges on either side. Old foot traffic has worn a faint but clear line through the rocks below us and we follow that down. Near the bottom of the descent, a number of different leads encourages us to push past the best route through the final cliff line. It is time to backtrack, to the first narrow chute where a short down climb brings us to the most painful section of the walk. 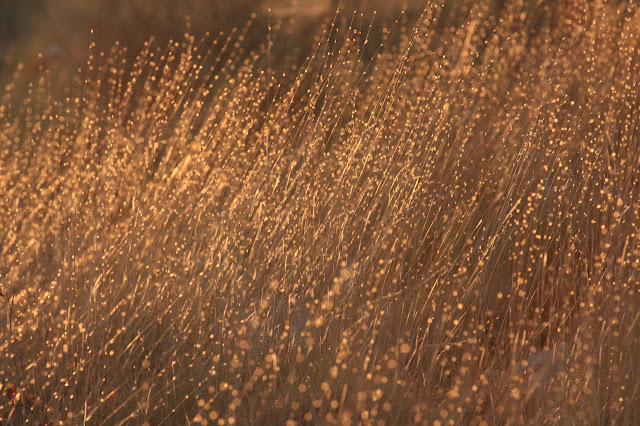 Pushing through thick, sharp Spinifex is the final challenge for the day before quickly sneaking onto the marked walking track opposite the Ghost Gum Lookout. 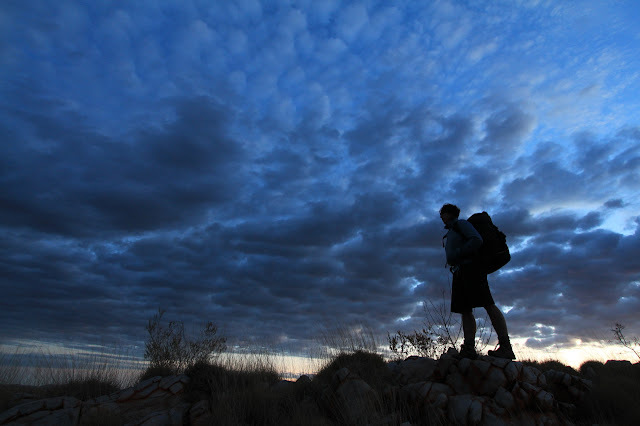 From now on it is a matter of following a new trail, not the dingo one and not a Euro trail, but the Touro trail. Travellers with day packs and little kids in tow file past us as we rest on the platform at the Ghost Gum Lookout and enjoy the view back down Ormiston Gorge. There is now awildland trail too. 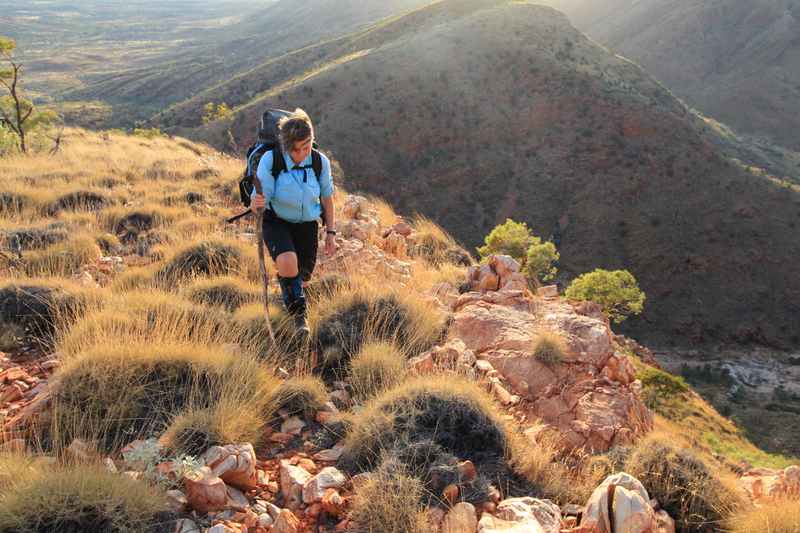 An overnight loop walk - if you know where to go - that follows dingoes and euros and touros. A faint pad, bootprints in the dust; a small wondrous path across the mountains.